The UN climate summit COP24 in Katowice, Poland, closed; below PIK’s statement which I think is somewhat overoptimistic, remembering that the Paris agreement does not entail any compulsion toward change. 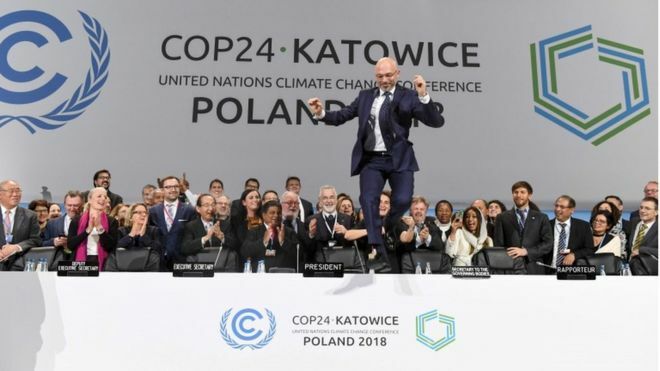 COP24 President Michal Kurtyka’s celebration (cf. pix above) at the end of COP24 seems wildly out of proportion with what was actually achieved. “Once again, governments accross the world have proven that they’re capable and willing to cooperate in order to protect their citizens from climate risks. Despite a growing number of populist governments, multilateralism succeeded.